Is There a Viable Alternative to Braces? Your Dentist Says Yes! When you get older, it’s understandable why you wouldn’t want to pursue orthodontic treatment, even if you really need it. When people see metal braces, their first thought typically goes to teenagers walking in hallways or even their own experience wearing braces as a child. This reason alone is enough to push people away from fixing their smile. However, braces aren’t the only way to realign teeth, according to your dentist. That’s where Invisalign’s series of clear aligners come into play. Invisalign’s aligners are designed to help patients realign teeth without others around them even noticing. That means gaps and crooked teeth can be shifted without making dramatic changes to your appearance. This may be especially important for adults who have already established a professional image at their workplace or who rely heavily on their appearance for their job and can’t afford to change it now. If you attend events or social gatherings where you know photos will be taken, you don’t want everyone to remember you for having a metal mouth. Additionally, if you fear that your aligners will still appear in photos, you can always briefly remove them while photos are being taken, then replace them once you’re done. Patients from previous generations may not have been able to get braces back in the day, but now they can easily fix mild to moderate issues without the need for brackets, wires, or any other metal hardware. In some cases, braces aren’t even an option because patients are allergic to the metals used. Aligners use custom-crafted thermoplastic to shift your teeth, so a metal allergy won’t prevent you from receiving treatment. Furthermore, braces require patients to visit their dentist quite often for tightening the hardware, which is necessary for shifting teeth. Since all the aligners you need are all fabricated at the start of treatment, you won’t need to visit the dentist as often. Simply move on to the next pair every two weeks or so to keep treatment going. 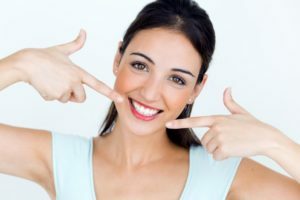 Another common reason adults pass on orthodontic treatment is the requirement to change their brushing technique and eating habits to accommodate braces. In the past, many patients who finish wearing braces discover their teeth is spotty due to mediocre oral care. Other patients don’t want to change their diet since many foods aren’t safe to eat with braces, including healthy foods like apples or other fruits. Since aligners are removable, brushing and eating doesn’t have to change just because you want to realign teeth. This will help reduce your chances of developing tooth decay and gum disease during treatment, while still giving you the freedom you had before starting. When you want to fix your crooked smile as an adult, you don’t have to settle. Schedule a consultation with your dentist today to get started! Dr. Drew Vanderbrook earned his DDS degree from the Baylor College of Dentistry. He continues his education through organizations like the Spear Center for Dental Excellence and is fully equipped to provide cosmetic orthodontic services like Invisalign. To get started learning about the process or learn more about his practice, contact him through his website. Comments Off on Is There a Viable Alternative to Braces? Your Dentist Says Yes!